William Cunningham (1805-1861) was an eminent Scottish theologian in the Reformed tradition and one of the founders of the Free Church of Scotland. 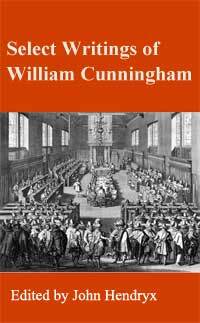 Cunningham is remembered primarily as a defender of Calvinism and the doctrine of the Trinity. He is one of the great resources on the history of the Reformation. Selected Titles include: Historical Theology; The Principal Doctrinal Discussions in the Christian Church Since the Apostolic Age; and The Reformers and the Theology of the Reformation. He studied at Edinburgh, was licensed as a preacher in 1838; settled as a minister in Greenock in 1830; moved to Trinity College Church, Edinburgh, in 1834; was appointed professor in the New College in 1843, and principal (in succession to Dr. Chalmers) in 1847. In his New College lectures, delivered from 1847 to 1861, Cunningham surveyed the history of theology training his eye on the tension between law and grace that has existed throughout the centuries. The lectures became the basis of his two-volume Historical Theology. The chapters of this book comprise some of his best writings.from the history of important controversies in the churcn.